With full-page newspaper ads, increased rhetoric by CEOs and a looming deadline, the war of words is heating up in Suncor's $4.5-billion hostile bid for Canadian Oil Sands — an indication the outcome is too difficult to predict. Prominent Canadian businessman Seymour Schulich is urging fellow Canadian Oil Sands shareholders to reject the offer at the current price. 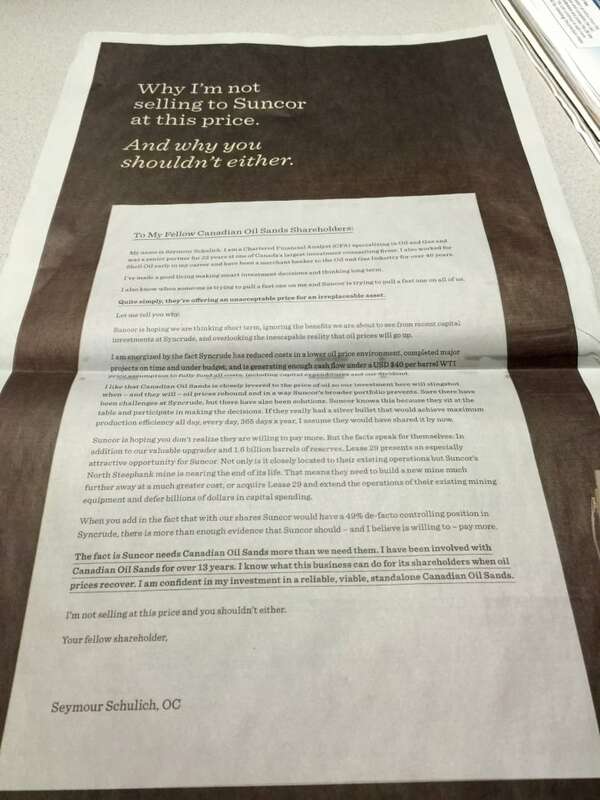 "The fact is Suncor needs Canadian Oil Sands more than we need them," wrote Schulich in his newspaper ad. He owns about five per cent of COS's shares. The intensified lobbying around the bid is an indication the outcome could go either way. "I used to tell my clients when I was a money manager that if I could read the future I wouldn't have to do this for a living," said Schulich in an interview with CBC News on Tuesday. "I have no idea. I've had a lot of people talk to me who don't like the bid." "What they ultimately do is a function of a whole lot of factors in their own organizations." 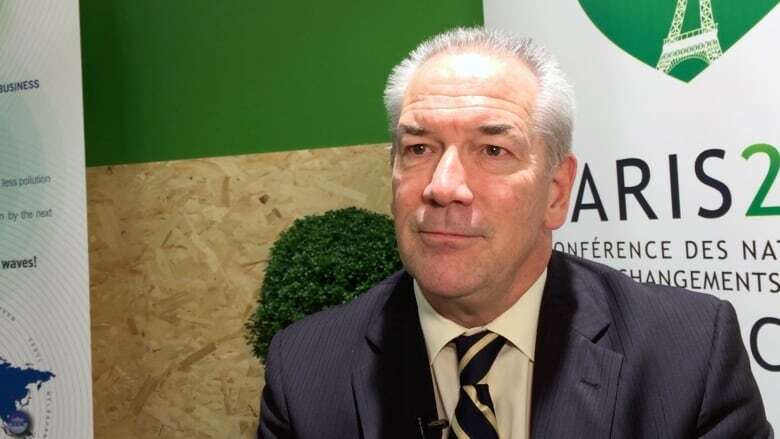 In a conference call Tuesday morning, Suncor CEO Steve Williams threw cold water on Schulich's arguments, saying the company wouldn't bid this much again. He also said there is no plan to extend or improve the current offer, turning up the heat on shareholders. "You must act now if you wish to accept our offer," he said on the call. "Canadian Oil Sands shareholders who have not tendered their shares have an important decision to make and precious little time to act." Both companies are partners in the Syncrude oilsands mine north of Fort McMurray, along with Imperial Oil. With majority ownership of the operation, Suncor can increase performance and reliability in many ways such as connecting the mine with the nearby Suncor site and sharing the use of facilities such as upgraders, Williams said. "The choice is yours," he said. "You can accept Suncor's offer and capture a significant premium while retaining oilsands exposure through Canada's leading integrated energy company or you can absorb an immediate share price decline, possibly of 40 per cent or more, and hope for an oil price recovery." Suncor took out its own newspaper ad on Tuesday stating "Hope is still not a strategy." The two sides have hurled insults at each other for the past few months, ever since Suncor showed interest in taking over its partner. Consulting firm Brendan Wood International has polled both retail and institutional investors about their intentions with the bid and the firm says the outcome is too close to call. The Canadian Oil Sands board has said the company can weather prolonged low oil prices on its own and thrive once crude prices recover. While no other prospective buyers have emerged, analyst Kurt Wulff isn't completing ruling that out. It's one reason why he doesn't like the Suncor bid. "I don't plan to tender my shares. The main reason is that I believe the value of Canadian Oil Sands is higher than what Suncor is offering," said Wulff, with McDep Associates. He owns shares in the company in his personal portfolio. Like many others, he isn't sure what the result will be after Friday's deadline. "That's a fair assessment. No one is convincing that they know the outcome."